As I’ve mentioned before, and many people already know, Mexico is a very affordable country to begin with. With current 2016 exchange rates, $1USD is equivalent to $18.76 pesos, so our money can really stretch. However, because everything is so cheap, it’s actually easy to want to buy everything and stop watching where the money goes. If you give into this temptation, I’m sure you’ll head home to a surprisingly larger bill than you expected. To avoid this, Peter and I continued to use our Trail Wallet app every day to track our expenses. You may have already heard Peter and I gushing about the cheap cost of food here. As we’ve mentioned, you can get amazing Mexican meals from a street vendor for less than $2 USD per person. This isn’t always the case though. In order to find these cheap meals, you need to be in less touristy areas, eating local food (foreign cuisine is pricier), and keep an eye out for where the locals eat. It’s almost always a better deal. Also, these extremely cheap deals are often from the street vendors. If you want an air-conditioned, sit-down meal, expect to pay more. It was not uncommon for us to see tacos for $1.50 USD in one place and next door see the same dish for $9USD. You have to watch prices and be prepared to move on if you think you can find it cheaper. Nearing the end of our trip, we got a little tired of having Mexican cuisine for breakfast, lunch, and dinner day in and day out, so we started searching around for other cultural cuisine. 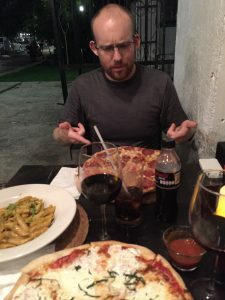 We ate some amazing Italian food that included two pizzas, a Coke, and two glasses of wine for $19USD, and we had some awesome Thai food with freshly squeezed juice for about the same price. Not $2, but still an amazing deal in comparison to U.S. prices. It often seemed more expensive to go to the grocery store and buy ingredients to cook than to go to cheaper local restaurants, so we ate out nearly every meal. The other nice thing is that in our hostels, breakfast was provided so we didn’t have to pay for that. Our amazing Italian meal at La Trattoria in Merida. It was so good, we went back two nights in a row! Where you choose to sleep has a big impact on your budget. If you stay in the touristy hotel zones, I’m guessing you can spend several hundred per night. Peter and I mostly stayed in hostels instead with 4-6 other people in the room with us. 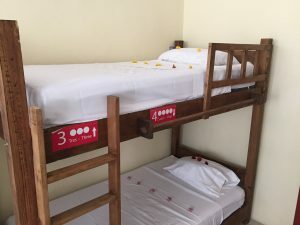 The typical hostel in Mexico costs about $8-11USD per person. The nice thing about hostels is that they cater to budget travelers in their 20s-30’s like Peter and me. They are well taken care of with kitchens to use, outdoor gardens, lockers for your stuff, helpful staff, and a sociable atmosphere. It is understood that when you go to a hostel, you’re open to meeting new people and making friends. 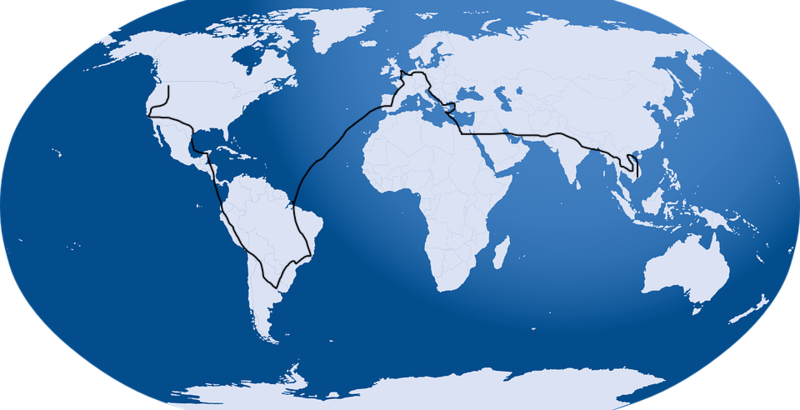 We’ve already met many awesome travelers from around the world this way. The downside to hostels is that you have to share the bathrooms, it can get loud with people getting up and going to bed at different hours in the same room, and you have to come to an agreement on the temperature of the room while you sleep. The latter has been the biggest problem for Peter and I so far (we’ll post on this soon), but we can deal with the former simply by sleeping with earplugs and an eye mask. 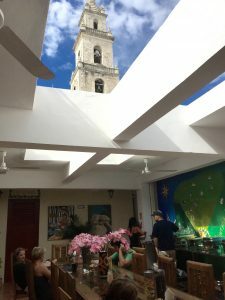 The best hostel we’ve ever stayed in was in the city center of Merida called Hostal Cathedral. There have been many other awesome ones as well. 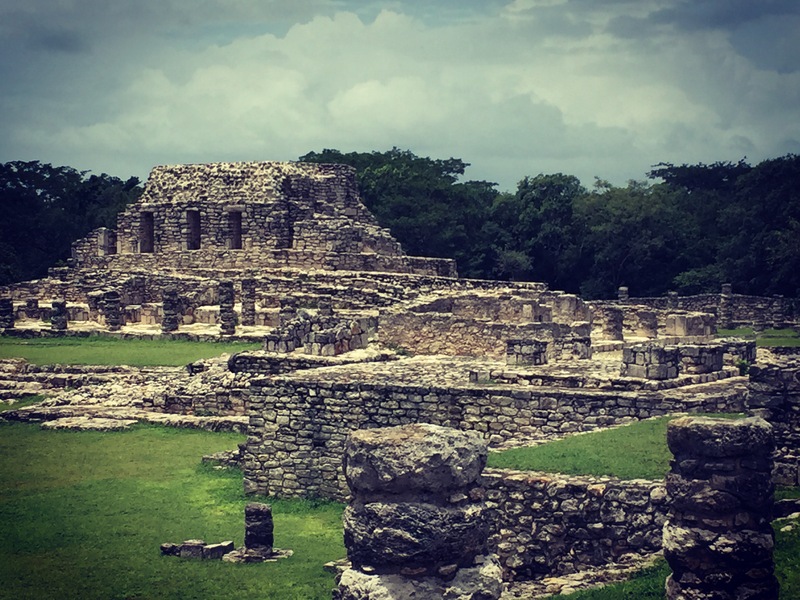 I came to Mexico to see all the Mayan ruins, and luckily they are very affordable to see. Even Chichen Itza, one of the new Seven Wonders of the World and the most expensive ruins, didn’t cost much: about $25USD per person including the Taxi Collectivo to and from the ruins, the entry fee, and the tour guide. The Mayapan ruins, by comparison, cost about $5.25USD per person for entry and transportation (you can’t get a tour guide there). If you’re interested in the architectural history of Mexico (ruins, churches, government buildings, etc), you can learn all about it for a very low fee. Once again, where you choose to spend your money can have a big impact on your budget. Peter and I spent a day touring the Hotel Zone in Cancun and Isla Mujeres and we were shocked at the price inflation. In Isla Mujeres, many people spent $20USD per hour to rent a golf cart to drive around the island (we didn’t do this), $35-60USD per person to snorkel, and $40USD per person to zip line. Although this all sounds like pretty good prices for these activities, all of this would have blown our budget. We wanted to snorkel, but it didn’t work out because I was wearing glasses that didn’t fit in the goggles. Instead, we opted to rent some beach chairs and an umbrella on the pristine white beach for about $16USD total (a higher cost than we expected). Isla Mujeres was easily our most expensive day in Mexico, and we didn’t even do much. In other words, be careful where you go to spend your money. This was the cenote (or underground pool) we swam in called Ik-Kil outside Chichen Itza. In summary, save money in Mexico by keeping track of your spending, staying in hostels, eating local street vendor food, and avoiding touristy areas. Peter and I had a blast here and we did it for $66 USD for two people per day, or $596 total for a little under a week and a half. We visited Cancun, Valladolid, and Merida, and we loved all of these cities. 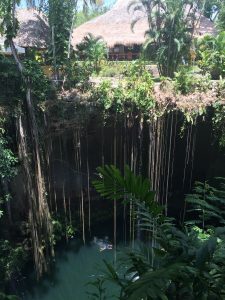 I did not include the longer bus rides between cities in this daily budget, but if you want to add that in, our total bus cost was less than $75USD for both of us to travel through the Yucatan and back to Cancun. It’s clear that Mexico is an enchanting country, and it can be affordable with any budget.